The high performance luminaire is designed for surface mount applications where long life, low maintenance, and consistent color rendering is required. Areas with limited accessibility due to fixture location or where heavy vehicle traffic makes maintenance difficult are ideal applications such as parking garages. 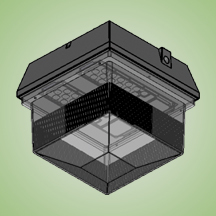 The heavy duty housing is constructed of edie cast aluminum. The optical assemblies are sealed in place using a silicone gasket for weather tight protection. Modular LED bricks wired in parallel for ease of maintenance. ETL listed for wet locations (IP64). Additional IP66 rating available upon request. The fixture can be surface mounted over a standard 4” box (provided by others) using the pre-set mounting holes and hardware provided with each fixture, it may be pendant mounted via 3/4” rigid pendant, or using the optional quick mount hanging bracket.